The 10-year bond yield is now at ~2.45%, a one-year low. 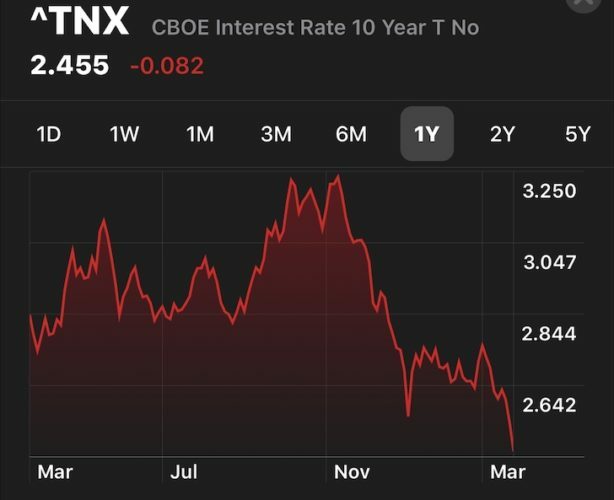 As recently as November 2018, the 10-year bond yield was at 3.2%. Given mortgage rates follow the 10-year bond yield up and down, mortgage rates are also back down to one-year lows. It doesn’t matter if the bull market continues or a recession is on the horizon now that the yield curve is inverted. Refinancing now makes a lot of sense because saving money always makes sense. Homeowners who are seeing their adjustable rate mortgages expire within one year or homeowners who bought when rates were much higher should especially consider refinancing. A ~0.75% decline in mortgage rates since 4Q2018 is significant. When I bought my current house in June 2014, the 10-year bond yield was at the same level as it is today. As a result, you’d think that my 5/1 ARM would see no adjustment. Unfortunately, my 5/1 ARM is tied to the one-year London Interbank Overseas Rate (LIBOR) plus a 2.25% spread. Given short-term rates have gone up, so will my 5/1 ARM when it adjusts this summer. If my 5/1 ARM had been tied to the 10-year bond yield, then my mortgage rate would have stayed the same.